In the southeast of Navarra, on the border with Aragón, the semi-desert landscape of the Bardenas Reales unfolded. The soils are made up of clay, chalk and sandstone and have been eroded by water and wind creating surprising shapes, canyons, plateaus, tabular structures and isolated hills, called cabezos. Despite its naked and inhospitable appearance, it hides great natural values. Not in vain, this Natural Park is declared a Biosphere Reserve by UNESCO and includes three Nature Reserves. Enjoy this lunar landscape, it will be unforgettable! The territory of the Bardenas shows remains of human presence from the Bronze Age and the Iron Age. However, the extreme conditions of these lands never allowed any permanent settlements. The Bardenas, like all surrounding territory, belonged to the Roman Empire and, subsequently, was subject to the invasion of barbarian peoples. With the occupation of the Arabs, the Bardenas became a boundary between the Christian and Muslim kingdoms. The reconquest determined that these lands would return in royal hands, hence its name (Real means Royal). This lunar landscape hostsimportant natural values, and for this reason it was declared a Biosphere Reserve by UNESCO in 2000. Inside there are two Special Protection Areas for Birds and three Nature Reserves. It is a perfect destination for active tourism and eco tourism. You can get around on foot, by bicycle, or on a horse ... You will discover unique places, like you´re in a scene of a movie. As a matter of fact, Game of Thrones was been recorded in Bardenas Reales! Or what about the famous bandit Sanchicorrota, who lived and operated in this area. Do not miss the Bardena Blanca either, with the unique formations of Castildetierra and Pisquerra, as well as the Bardena Negra and the Aleppo pine forests. To get a good view, go up to the Alto de Aguilares viewpoint, and bird spotting, come to the Balcón de Pilatos. 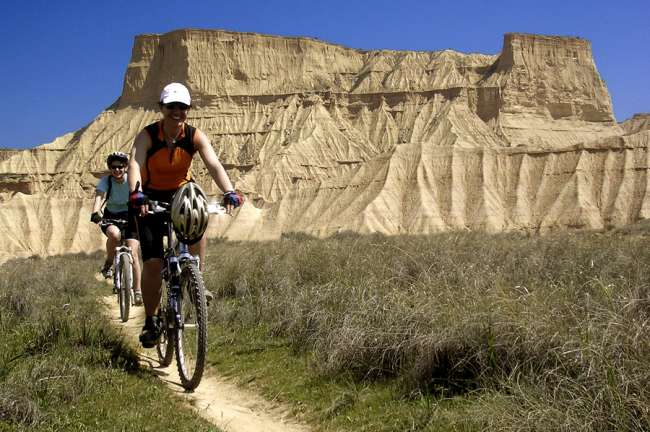 Half an hour from the Bardenas Reales, is the city of Tudela, known for its rich cuisine. Founded in the year 802, it is one of the most important cities of Islamic origin in Spain and Europe. For more than 400 years, Muslims, Jews and Mozarabs, lived in this city, and this will become clear to you when you are walking through its twisted streets and alleys and observe the city walls and watchtowers. Do not miss the cathedral, the Magdalena church or the stone bridge. We also recommend you to visit the Monastery of Tulebras, the first female monastery that the Cistercian founded in Spain; the medieval village of Olite ; or the theme park Sendaviva in Arguedas. In the Aragonese part, you cannot miss the Pre-Pyrenean region of the Cinco Villas. It is dotted with charming villages such as Uncastillo, Sos del Católico, or Ejea de los Caballeros. We highlight Uncastillo for its imposing historical heritage, with a castle of the 10th century, six Romanesque churches, a Jewish quarter and beautiful Renaissance buildings from the 16th century. 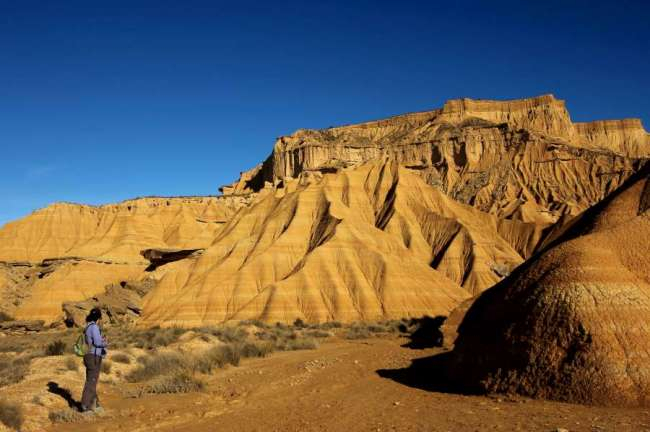 Bardenas Reales benefits from both Navarre and Aragonese cuisine. 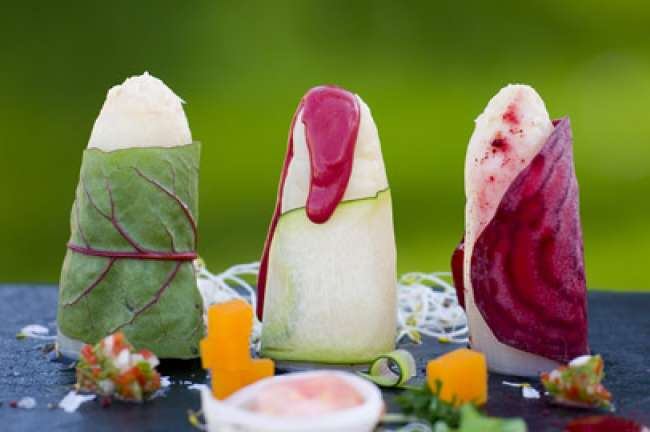 The Navarrese gastronomy consists of many home grown vegetables and wines, because of the fertile soil next to the Ebro River. Among the typical dishes are the cocido tudelano, the stew with vegetables, the shanks, the lamb ribs, the partridges and the calderete. And for dessert: fresh and local fruits. The Aragonese pantry, specifically, of the Cinco Villas region, is not far behind either. The waters of the Pyrenees irrigate the lands of the north and those of the Ebro river do it in the southern lands, offering a varied gastronomy. Outstanding wine, oil, cheese, honey, vegetables and good pastries, as well as roasted ternasco, ranch or crumbs. So much tasty food! At an hour from the Bardenas Reales, in the beautiful village of Uncastillo, where you can stay in Posada la Pastora, a small boutique hotel with 10 rooms. 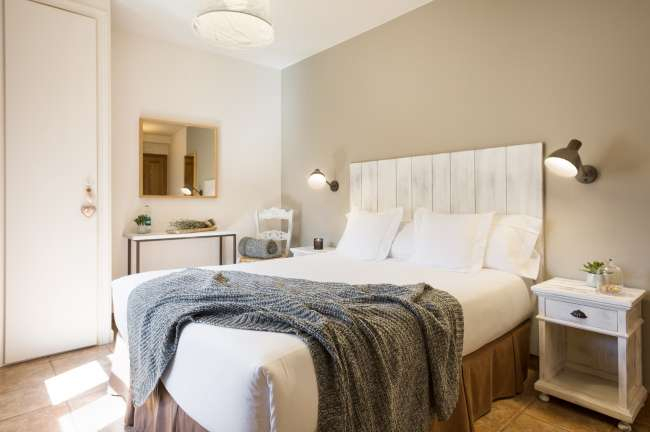 The hotel welcomes its guests with a warm decoration with stone and wooden materials that are carefully restored during the restauration of the building. The living room is the heart of the house, where you can relax next to the fireplace. And their hosts, Inma and Miguel, love the Pre- Pyrenees and can advice you on the best destinations. You can enjoy outdoor activities in the Protected Landscape of the Sierra de Santo Domingo, Foz de Lumbier, Mallos de Riglos, Puy Moné and, of course, in the Bardenas Reales. An unforgettable experience! If you travel as a family or with friends, another option is the Uncastillo Apartments!